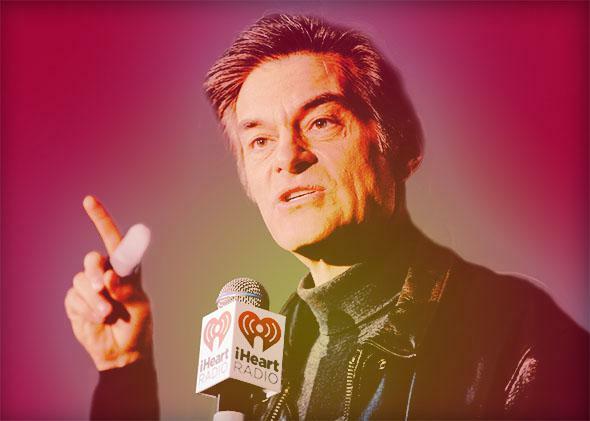 Arctic apple safety: Dr. Oz sows seeds of mistrust on GMOs. Dr. Oz sows seeds of mistrust on genetic engineering. Dr. Mehmet Oz does not recommend an Arctic apple a day. Surgeon–turned–television doctor Mehmet Oz opened his show on March 10 with a “Dr. Oz Investigation” on the newly U.S. Department of Agriculture–approved “Arctic” apple, which doesn’t undergo the unappetizing browning that other apples do when it’s bitten, bumped, or cut. The episode, titled “The Non-Browning GMO Apple: Is It Safe?,” pushed the fallacy that there is some sort of “right to know” (via labeling) whether a food has been produced with the techniques of molecular genetic engineering (aka “genetic modification,” or GM). The reason the Arctic apple doesn’t discolor involves ingenious but simple biology. Enzymatic browning in apples is caused by the fruit’s intrinsic chemical reaction to cell injury, which ruptures the cells and triggers chemical reactions between the enzyme polyphenol oxidase (PPO) and the substances that cause the apple flesh to turn brown. A family of four genes controls the majority of PPO production, and by inserting low-PPO-producing genes from other apples, scientists were able to turn off more than 90 percent of PPO production. Would you buy this apple if I told you it wouldn’t brown when you cut into it or took a bite? Would you buy this apple if I told you it was genetically modified to not turn brown? Well, a lot of people are banking on your answer. The U.S. Department of Agriculture recently approved the first genetically modified apple. They’re calling them the Arctic apple. This latest manifestation of New Age nonsense is vintage Oz. The FDA slammed him in 2011 for an “irresponsible and misleading” report on arsenic in apple juice, and in June 2014 at a hearing, members of the Senate Commerce, Science, and Transportation Committee grilled and thoroughly humiliated Oz for his hawking of fraudulent products. In addition, publications including the Washington Post, the New Yorker, and Slate have criticized his anti-science views. The James Randi Educational Foundation has no fewer than three times bestowed on Oz its Pigasus Award, which is given “to expose parapsychological, paranormal or psychic frauds that Randi has noted over the previous year.” The last two of these were for support of faith healing and psychic communication with the dead, among other things (2010), and “Refusal to Face Reality” for his continued promotion of “quack medical practices, paranormal belief, and pseudoscience” (2012). Among scientists, Oz is known for his anti-genetic-engineering propaganda, which he promotes regularly on his TV program in concert with outspoken biotech opponents who lack medical or scientific backgrounds. In September 2014, Oz featured Zen Honeycutt, founder of the anti-genetic engineering organization Moms Across America, who shared her bias without a hint of skepticism or so much as a follow-up question from Oz. Like many antagonists of genetic engineering, Honeycutt attempted to demonize glyphosate, an herbicide used in various types of farming, because some genetically engineered crops are used in conjunction with it. Honeycutt claimed that her son had been experiencing symptoms of autism, and she wanted his urine tested for chemicals used in farming. His doctor declined, so she used a private lab that supposedly detected glyphosate levels “eight times higher than found anywhere in Europe [in] urine testing.” She claimed that within six weeks of going “completely [genetic engineering]–free and organic, his autism symptoms were gone, and the level of glyphosate was no longer detectable.” She didn’t clarify what European data were used for comparison or why. There is no medical evidence that exposure to glyphosate has any connection with autism; in fact, glyphosate has lower overall health impacts than white vinegar (aka the chemical acetic acid) when used as a herbicide. This sort of nonsense is part of a longstanding pattern. Oz’s wife and the co-producer of his program, Lisa Oz, is a supporter of brazen anti-genetic-engineering campaigner and self-described levitator Jeffrey Smith. An advocate of alternative health products—the manufacturers of which happen to sponsor her and Dr. Oz’s radio and television programs—Lisa Oz recently collaborated with Smith and served as narrator for his lurid and ludicrous anti-genetic-engineering movie. Oz made an attempt to appear balanced on the March 10 program—he interviewed Neal Carter, apple grower and founder of Okanagan Specialty Fruits, the creator of the Arctic apple. When asked how to detect whether a nonbrowning apple is rotting, Carter explained, “It’s important to understand that Arctic apples are just like any other apple in this regard.” He described how only the enzymatic browning of the Arctic apple has been “turned off.” When an apple rots, pathogens have their own enzymes that make it turn brown. Thus, these apples will brown when they rot. Neither Oz nor Hansen seems to understand that the entire apple industry owes the diversity of varieties to different gene expression patterns. A Golden Delicious apple looks and tastes different from a Red Delicious because different apple genes are expressed. Recent genomic sequencing shows there are about 57,000 genes in the Golden Delicious apple. Hansen then invoked the issue of “fraud,” lamenting that without labels at salad bars and elsewhere, most consumers will see unblemished sliced apples and think they’re freshly cut. Thereby, Hansen turns a red fruit into a red herring. Do sliced cucumbers or radishes turn brown to warn customers of waning freshness? Leading up to the segment’s conclusion, Oz gushed to Carter, whose company created the Arctic apple, “I treasure the fact that you’re here. It’s hard to have this conversation in America right now; the two sides aren’t talking to each other very much. I commend you for your transparency, and the fact that you’ve been willing to come here and articulate in a very tasteful way at many levels.” The tacit message was, of course, that Carter is a rare exception to the usual mendacious, obfuscating biotech proponents. Oz then implored Carter to extend his transparency to labeling Arctic apples in the marketplace as genetically engineered (presumably so that consumers could avoid them). Carter didn’t bite. He responded calmly that the proponents of labeling are anti-biotech. “It’s being driven by other business objectives and I think that’s completely wrong.” For that reason, he stated that the fruits will be labeled with the Arctic logo, but not explicitly as genetically engineered. Dr. Oz fails to understand that there is a centuries-old seamless continuum of genetic modification of crops, animals, and microorganisms, performed by a variety of pre-molecular techniques, some of which have drastically altered the foods that we consume routinely. Some have moved genetic material from one species or genus to another to yield outcomes that don’t exist in nature. Farmers and plant breeders have been creating new varieties of apples for millennia. The new molecular techniques for accomplishing this are far more precise, predictable, and conservative than older, unregulated techniques for genetic improvement. With the exception of wild berries, wild game, wild mushrooms, and most fish and shellfish, all of the foods in our diets come from organisms that have been genetically modified in some way; and about three-quarters of the processed foods in American markets contain ingredients from organisms genetically engineered with molecular techniques similar to those used to create Arctic apples. Touting consumer choice as a right is a subterfuge. When there is sufficient demand, market forces provide labels that people want, like kosher, halal, or organic. Dr. Oz might think he can emulate Dorothy by clicking his heels three times and making his claims true—and he may have luck convincing others that they are—but science and common sense argue otherwise.